There are some general questions our customers usually ask and the information below addresses those inquiries. If you do not see an answer to your question, do not hesitate to call Eagle Plumbing. Gus Heinze will answer your phone call personally. Gus Heinze answers questions about plumbing issues and services. Q: Is there a way to prevent my sink from becoming clogged? A: Be sure that liquids, such as grease, are not poured down the drain. Some liquids solidify and clog the pipes. Some solids, such as lettuce, celery, and potato peelings, can be stringy and clog up the pipes. It is advisable to toss those types of food items in the garbage can. Wipe up any debris, such as hair, in the bathroom sink, shower, or tub before it becomes a problem. Even small amounts of hair can cause problems. If your drain does become clogged, call Eagle Plumbing to fix the problem. Q: What caused my faucet to start dripping? A: There could be a number of reasons. Water with a high level of minerals could have corroded the inside of the faucet mechanism. Or, some parts of the inside of the faucet may have worn out and need to be replaced. 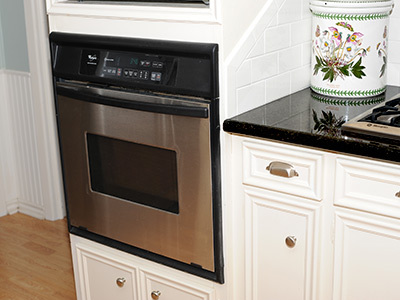 Eagle Plumbing has the expertise to determine if a gasket, o-ring, or washer may be the problem. It is not uncommon to arrive at a call and have to replace the entire water faucet mechanism because the homeowner tried to repair the "simple" problem and scratched or broke the faucet because he did not have the training or proper tools to do the job the right way. Leave your home immediately if you smell gas. Call the gas company and Eagle Plumbing once you are safely outside. Q: I smell gas in my house. What should I do? A: The most important thing to do is to get everyone out of the house. Be sure that no switches, such as light switches, are turned on---just leave the house. Then, call the gas company and a plumber. They will make sure your house is safe for you and your family to return. Q: There is a plumbing emergency in my house. Is Eagle Plumbing available for emergencies. A: Yes, Eagle Plumbing is on call for emergencies. Call 1-979-450-5346. Q: There may be a water leak in my pipes. How do I know if I should call a plumber? A: First, turn off all the water in your house. After the water is off, do you hear the sound of running water? If so, you have a leak. Secondly, when your water bill arrived, was it larger than normal? If so, you may have a leak. Q: There is a small drip in my sink? Should I call Eagle Plumbing? A: Yes, it would be advisable to call us. We have the proper tools and training to fix the leak without ruining the hardware and causing further damage. Q: How much will it cost to fix or repair my plumbing problem? A: It is difficult to give an exact price over the phone, but Eagle Plumbing will make a house call and give you an exact price. There will be no surprises when you receive your statement. Q: There is water under my hot water heater. Should I call Eagle Plumbing? A: This could be an indication the bottom of your hot water heater has rusted out and water is escaping onto the floor. 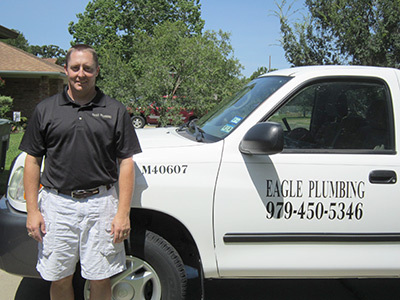 Call Eagle Plumbing to determine if the problem can be repaired or if it needs to be replaced.